The innovation of Blockchain technology is credited to a person or a group of people under the name Satoshi Nakamoto. Although this name is connected to the creation of Blockchain, an undeniably ingenious invention, not much is known about its real identity. Blockchain became popular as the heart of Bitcoin and other virtual currencies; however, it seems to be more than this, especially when it comes to the potential it has to transform and to modernize the global economy. 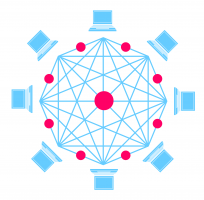 From a technical perspective, Blockchain technology is also known as a distributed database that differs from the relational databases that currently dominate the market. A distributed database improves security, transparency and efficiency, in contrast to the current relational database management model where the support of transactions and computations relies on databases that are used as central repositories. Transparency, security and efficiency are being improved by the control of a distributed database that does not rest with its owner like it happens with the relational database model. Among others, Know-Your-Customer (KYC) and Anti-money Laundering (AML) are potential Blockchain use cases. Currently, institutions offering financial or professional services are obliged to follow time-consuming and expensive practices for each new customer. The adoption of Blockchain technology can lead to the reduction of the AML/KYC cost because of its cross-institution client verification capability as well as the effectiveness of monitoring and analyzing data, required for AML/KYC checks. Essentially, with Blockchain, the verification of a client or the legality of a transaction could take place only once and the final result will be cryptographically stored in Blockchain. Therefore, organizations such us banks or administration services providers (ASPs) will get rid of the multi-step AML/KYC processes as they could have the option to access a distributed database that will provide them with the final results of those processes. More specifically, all the information that is related to a client will become available to organizations with the appropriate permissions via a distributed database that will be considered as a single source of “truth”. It is worth mentioning that Blockchain is an immutable technology and as soon as the data are verified and stored in the distributed database then it is impossible to be manipulated, they can only be updated. The speed and ease with which Blockchain allows participants to obtain useful and quality information make it very appealing to regulators, banks or law enforcement agencies around the world. Blockchain is a nascent technology and its adoption implies change. And when something is new and brings change can be challenging especially if it is related to sensitive data and legal matters. The value of this emerging and growing technology, which has strong advocates, still needs to be clarified since there are challenges that need to be taken into consideration before its adoption. Challenges such as Privacy, Standardization and Liability. Next, these are presented in more detail. Privacy – Corporates will not like the fact that their KYC documentation or digital identity will be available to various banks with which they do not have or have suspended the business relationship. As a result, a solution that will handle view access should be explored, but it should be carefully studied before applied since the immutable nature of Blockchain needs to be protected. Standardization – When banks are within same jurisdiction, which indicates that they need to follow the same KYC rules, standardization seems to be feasible. However, things can become more complicated when banks are under different jurisdictions and/or they want to follow their in-house KYC procedures related to their own risk appetite and clienteles’ profile. Liability – What happens in the case a customer, who has already been verified, executes a fraudulent transaction? Someone needs to be responsible to re-verify client’s digital identity so that the distributed database is updated. However, is not clear who could be responsible to do this and how often the re-verification process should be executed. To sum up, the power of Blockchain technology is driven by the network nodes. Each node could be a market participant such as tax authorities, company registries, law enforcement bureaus, media houses, judicial bodies, banks and corporates. This implies that the collaboration amongst market participants is required and it can lead to a mutually beneficial solution. On the other hand, the KYC and AML space is a domain of enormous risk and hence investment. Blockchain solutions are being explored for this challenge by banks and FinTechs and it is not entirely clear, yet, how the particular Blockchain use-case will evolve. Note: This article has also published on the following websites.